It isn’t uncommon for our relatives to make us sick – literally. Many families have stories of the infamous holiday everyone came down with a bug inadvertently packed in by visitors. Turns out non-humans have similar experiences, sometimes with more deadly consequences. 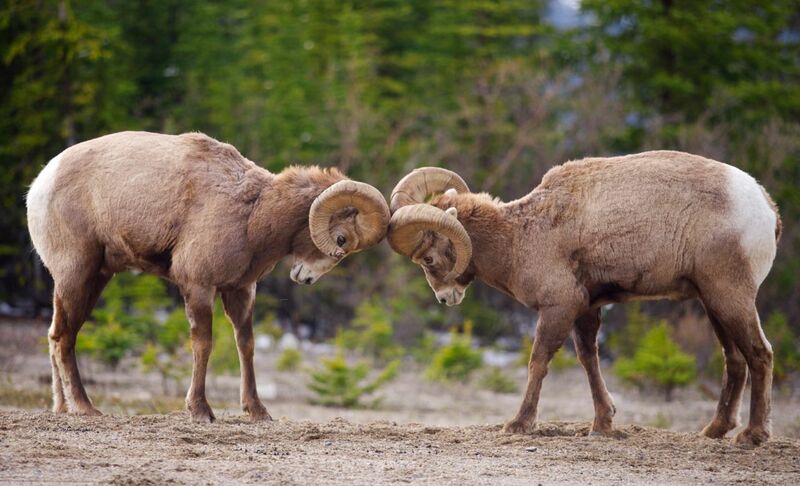 At the beginning of the nineteenth century, there were between 1.5 million to two million bighorn sheep throughout western North America. By the 1920s, they were eliminated from half-a-dozen states in the U.S. and parts of Mexico. Populations have been re-established in some places with sheep transplanted from healthy populations, but the country still has fewer than 70,000 of the animals. The Peninsular and Sierra Nevada populations are listed as federally endangered. Not everyone wants to blame the not-so-distant wooly relatives, but a paper published in the journal Preventive Veterinary Medicine in 2012 reported that 11 studies published between 1979 and 2009 found 98 percent of bighorn sheep that mixed with domestic sheep died of pneumonia. When bighorns mingled with cattle, horses, deer, elk and llamas, 93 percent survived. Clearly, domestics are the black sheep of the family. Melissa Cain, bighorn conservation director for Western Watersheds Project, says part of the problem is that bighorn sheep periodically wander to find other herds. “Historically, they would have encountered other bighorns, including potential mates,” she says. “But now, they encounter domestic sheep.” The gregarious and unsuspecting bighorns happily hang out with their domestic cousins. Domestic sheep also wander, compounding the problem. “There are thousands of domestic sheep on public land grazing allotments, and one herder can’t keep up with all of them,” Cain says. Pneumonia outbreaks cause 30 to 90 percent mortality in a bighorn herd. At least several years of annual outbreaks among lambs usually follow, hampering the herd’s recovery. Simply separating bighorns and domestics solves the problem. But the situation is more complicated. Several conservation groups, including the National Wildlife Federation and Wild Sheep Foundation, compensate ranchers willing to retire a grazing allotment. “This buyout program is a win-win solution, the only one we’ve identified,” says Cain. To add insult to injury, bighorn sheep face a host of other challenges: shrinking range and restriction of movement by existing and proposed wall structures on the U.S. border with Mexico, habitat loss and fragmentation, competition with domestic livestock for grazing, wildfire suppression, and vehicle collisions. Unfortunately, so do those disease-carrying domestic relatives. For more information visit the Bighorn Sheep Disease Research Consortium and be on the lookout for a new NATURE short film on the subject premiering online on December 10.